Biosimilars - Can the dream of affordable cancer care come true? Can the dream of affordable cancer care come true? and the complex biological medicines used to treat it are expensive. Even the world’s richest countries will struggle with the cost of providing these drugs to patients and so tackling the issue of affordable cancer care is something we need to address now. Biosimilars are being developed as part of an increased effort to reduce the cost of biologic medicines and give patients better access to life-saving treatments; however, these cheaper alternative versions of originator, branded drugs have not been accepted with as much enthusiasm as expected. First, we need to understand why we need biosimilars. Paul Cornes, MD, University Hospital Bristol NHS Foundation Trust, Bristol, UK is one of the UK’s leading experts in biosimilars. Biologic treatments are allowing patients to live longer. Nowadays they can live for many years with some cancers, including chronic blood cancers. Understanding the cost of long-term treatment in cancer, helps us to appreciate how biosimilars could be part of the solution for affordable cancer care. The WISH report focusses on the next decade for the wealthier, English-speaking countries: US, UK and Australia. The report demonstrates that most modern cancer medicine has become unaffordable. The Lancet Comission was set up to look at affordable oncology in high-income countries. We are at a crossroads now and the decisions that we make or we refuse to make will have a consequence that will resonate into the future. This paper covers the tools that clinicians can use to increase access to affordable innovation, and it signposts the steps we should take to help make the innovation we need in oncology and hematology affordable in the future. Where two alternatives for treatment exist, always use the cheapest one if it won’t sacrifice quality. Despite growing interest in biosimilar treatments, there is a lack of trust among the physician community. We spoke to many hemonc specialists during ASH 2016 and they shared common concerns, all centering around a lack of trust in the efficacy and safety of biosimilars compared with originator biologics. How can we trust that biosimilars are similar enough, and how can we be absolutely sure our patients will receive the same level of care? Paul Cornes takes us through the concept of batch variation in branded biologics, how it has been justified by regulators and trusted by doctors, and how the same principles and strict rules have been put in place to justify the manufacture of biosimilar drugs. The antibodies neutralised the drug, and led to profound anaemia that required repeated transfusions and immune modulation drugs. The case of epoetin alpha taught us a lot about the complexity of biologic drugs and how to manage variation over time. This is important for biosimilars because we now know that aggregates of the drug that are formed in the subcutaneous route of delivery were much more immunogenic. This can be detected with a physiochemical test of the drug, meaning that new varieties of an established drug as it’s manufactured differently over time now have a new critical attribute to meet in order to maintain quality. This is just one example of a critical attribute of a drug that regulators will want to maintain within a very close range over time. 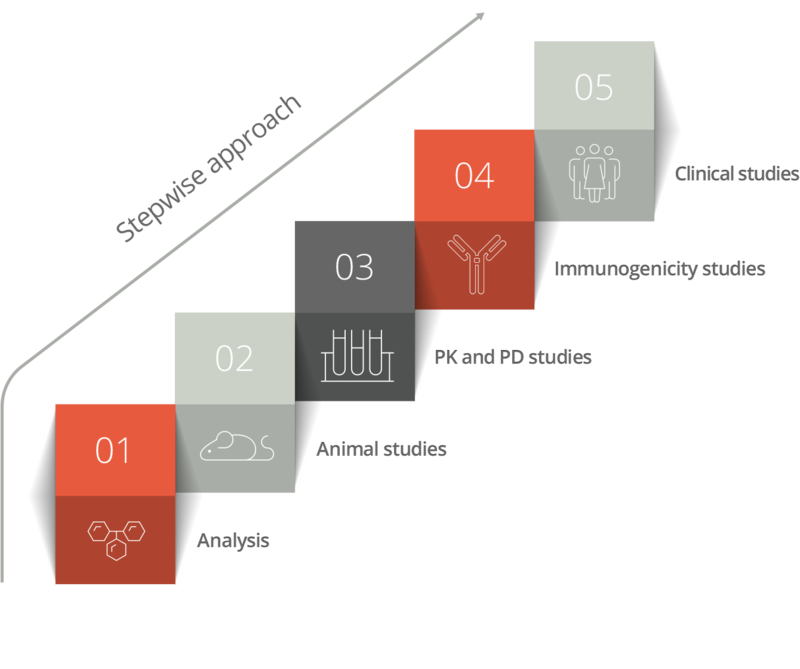 In 2003, the European Medicines Agency (EMA) put in place a regulatory pathway for biosimilars, which would be followed by a post-authorisation safety study (PASS) – known as Phase IV study. The PASS studies would help regulators understand if biosimilars would behave in the real-world in the same way as the originator. Today, these studies are no longer required, as Paul Cornes explains in a video below. The European regulatory pathway is well-established and robust enough to approve novel biosmilars coming into the market. How is the use of a biosimilar approved? What do regulators look for? How do they guarantee their safety? Paul Cornes takes us through some of the requirements. Biologics have to go through large, randomised clinical trials to ascertain whether they can be used in a new indication. This is not true for biosimilars. We are used to measuring differences, not sameness, and relying on clinical trials to demonstrate a significant improvement in outcomes. This approach is not suitable for measuring sameness. Once we’ve established sameness and safety in the most complicated disease population, then analytic studies are enough to allow approval in other indications. Paul Cornes takes us through the journey of extrapolation for biosimilars. A more detailed audio and slide presentation in our ‘Further reading’ section explains the theory in more detail. Written by the biosimilars working party of the European Medicines Agency, this article is an important read for those unconvinced or sceptical of the extrapolation of indication in biosimilars. Our short slideshow, featuring Paul Cornes, will help you understand the rationale behind extrapolation of indication. Thomas R et al. Delivering affordable cancer care a value challenge to health systems. Report of the WISH Delivering Affordable Cancer Care Forum 2015. Available from: www.wish.org.qa [Accessed March 21, 2017]. Sullivan R et al. Delivering affordable cancer care in high income countries. Lancet Oncology, 2011;12(10): 933-980. Schellekens H. Biopharmaceutical immunogenicity: association between epoetin alfa and pure red cell aplasia. European Journal of Hospital Pharmacy. 2003;8(3): 68-9. Sharma B et al. Technical investigations into the cause of the increased incidence of antibody-mediated pure red cell aplasia associated with Eprex. European Journal of Hospital Pharmacy. 2004;10(5): 86-91. FDA Overview of Biosimilar Products Course. Available from: http://fdabiosimilars.e-paga.com/ [Accessed March 21, 2017]. Weise M et al. Biosimilars: what clinicians should know. Blood. 2012;120(26): 5111-5117. Weise M et al. Biosimilars: the science of extrapolation of indication. Blood. 2014;124(22): 3191-3196.